In a mixing bowl, combine oyster sauce, fish sauce, honey, lemongrass, spring onion, garlic and olive oil. Mix well. Add lamb cutlet and stir to coat in marinade. Cover and refrigerate for at least 2 hours or overnight. Preheat a barbecue grill plate. 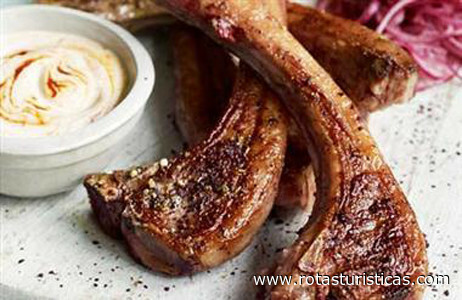 Remove cutlets from marinade and cook for 2-3 minutes each side for medium-rare. Place on a serving platter and top with spring onion oil and chilli. Combine herb salad ingredients in a large bowl. Serve lamb with salad.